Kiani, S., Khodabakhshi, S., Rashidi, A., Tavakoli, Z., Dastkhoon, S. (2018). Novel One-Pot Synthesis of Pyrazolopyranopyrimidinones Using Newly Produced γ-Alumina Nanoparticles as Powerful Catalyst. Iranian Journal of Chemistry and Chemical Engineering (IJCCE), 37(3), 63-71. Sajad Kiani; Saeid Khodabakhshi; Alimorad Rashidi; Ziba Tavakoli; Sadegh Dastkhoon. "Novel One-Pot Synthesis of Pyrazolopyranopyrimidinones Using Newly Produced γ-Alumina Nanoparticles as Powerful Catalyst". 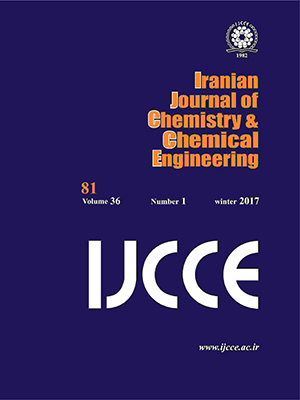 Iranian Journal of Chemistry and Chemical Engineering (IJCCE), 37, 3, 2018, 63-71. Kiani, S., Khodabakhshi, S., Rashidi, A., Tavakoli, Z., Dastkhoon, S. (2018). 'Novel One-Pot Synthesis of Pyrazolopyranopyrimidinones Using Newly Produced γ-Alumina Nanoparticles as Powerful Catalyst', Iranian Journal of Chemistry and Chemical Engineering (IJCCE), 37(3), pp. 63-71. Kiani, S., Khodabakhshi, S., Rashidi, A., Tavakoli, Z., Dastkhoon, S. Novel One-Pot Synthesis of Pyrazolopyranopyrimidinones Using Newly Produced γ-Alumina Nanoparticles as Powerful Catalyst. Iranian Journal of Chemistry and Chemical Engineering (IJCCE), 2018; 37(3): 63-71.
g-Alumina nanoparticles (g-Al2O3 NPs) were prepared via a new and simple synthetic route and characterized by field emission scanning electron microscopy, X-ray diffraction, and Fourier transform infrared spectroscopy. The catalytic activity of prepared g-Al2O3 NPs was investigated for the new one-pot, four-component synthesis of some fused tri-heterocyclic compounds containing pyrazole, pyran, and pyrimidine. In another investigation, the recyclability of the prepared nanocatalyst was also studied. It was proved that the nanoparticles can act effectively for at least four cycles without appreciable loss in activity. This novel procedure has some advantages such as high efficiency, simplicity, high rate, and environmental safety. Wang D., Astruc D., Fast-Growing Field of Magnetically Recyclable Nanocatalysts, Chemical Reviews, 114(14): 6949-6985 (2014). Shahamirian M., Kiani S., Jorsaraei Talar A., Khodabakhshi S., Functionalized Nano Graphene Platelets as Green Catalyst to Synthesize New and Known Benzoyl-1, 4-diazanaphthalene and Study of Their Local Aromaticity, Polycyclic Aromatic Compounds, 37(1): 81-91 (2017). Saadatjou N., Jafari A., Sahebdelfar S., Synthesis and Characterization of Ru/Al2O3 Nanocatalyst for Ammonia Synthesis, Iranian Journal of Chemistry and Chemical Engineering (IJCCE), 34(1): 1-9 (2015). Karami B., Nikoseresht S., Khodabakhshi S., Novel Approach to Benzimidazoles Using Fe 3 O 4 Nanoparticles as a Magnetically Recoverable Catalyst, Chinese Journal of Catalysis, 33(2): 298-301 (2012). Khalafi-Nezhad A., Divar M., Panahi F., Magnetic Nanoparticles-Supported Tungstic Acid (MNP-TA): an Efficient Magnetic Recyclable Catalyst for the One-Pot Synthesis of Spirooxindoles in Water, RSC Advances, 5(3): 2223-2230 (2015). Dehno Khalaji A., Solid State Process for Preparation of Nickel Oxide Nanoparticles: Characterization and Optical Study, Iranian Journal of Chemistry and Chemical Engineering (IJCCE), 35(2): 17-20 (2016). Kale S.R., Kahandal S., Burange A., Gawandeb M.B., Jayaram R.V., A Benign Synthesis of 2-amino-4H-Chromene in Aqueous Medium Using Hydrotalcite (HT) as a Heterogeneous Base Catalyst, Catalysis Science & Technology, 3(8): 2050-2056 (2013). Gawande M.B., Pandey R.K., Jayaram R.V., Role of Mixed Metal Oxides in Catalysis Science—Versatile Applications in Organic Synthesis, Catalysis Science & Technology, 2(6): 1113-1125 (2012). Dastkhoon S., Tavakoli Z., Khodabakhshi S., Baghernejad M., Khaleghi Abbasabadi M., Nanocatalytic One-Pot, Four-Component Synthesis of Some New Triheterocyclic Compounds Consisting of Pyrazole, Pyran, and Pyrimidinone Rings, New Journal of Chemistry, 2015. Bhattacharyya P., Pradhan K., Paul S., Das A.R., Nano Crystalline ZnO Catalyzed One Pot Multicomponent Reaction for an Easy Access of Fully Decorated 4H-Pyran Scaffolds and Its Rearrangement to 2-Pyridone Nucleus in Aqueous Media, Tetrahedron Letters, 53 (35): 4687-4691 (2012). Karami B., Hoseini S.J., Eskandari K., Ghasemi A., Nasrabadi H., Synthesis of Xanthene Derivatives by Employing Fe3O4 Nanoparticles as an Effective and Magnetically Recoverable Catalyst in Water, Catalysis Science & Technology, 2(2): 331-338 (2012). Kuo, S.C., Huang L.J., Nakamura H., Studies on Heterocyclic Compounds. 6. Synthesis and Analgesic and Antiinflammatory Activities of 3, 4 Dimethylpyrano [2, 3-c] Pyrazol-6-one Derivatives, Journal of Medicinal Chemistry, 27(4): 539-544 (1984). Dastkhoon S., Tavakoli Z., Khodabakhshi S., Baghernejad M., Khaleghi Abbasabadi M., Nanocatalytic One-Pot, Four-Component Synthesis of Some New Triheterocyclic Compounds Consisting of Pyrazole, Pyran, and Pyrimidinone Rings, New Journal of Chemistry, 39 (9): 7268-7271 (2015). El-Agrody A.M., Fouda A.M., Al-Dies A.-A.M., Studies on the Synthesis, in Vitro Antitumor Activity of 4H-benzo [h] Chromene, 7H-benzo [h] Chromene [2, 3-d] Pyrimidine Derivatives and Structure–Activity Relationships of the 2-, 3-and 2, 3-Positions, Medicinal Chemistry Research, 23(6): 3187-3199 (2014). Karami B., Haghighijou Z., Farahi M., Khodabakhshi S., One-Pot Synthesis of Dihydropyrimidine-Thione Derivatives Using Tungstate Sulfuric Acid (TSA) as a Recyclable Catalyst, Phosphorus, Sulfur, and Silicon and the Related Elements, 187(6): 754-761 (2012). Kiani S., Samimi A., Rashidi A., Novel One-Pot Dry Method for Large-Scale Production of Nano γ-Al2O3, Monatshefte für Chemie-Chemical Monthly, 147(7): 1153-1159 (2016). Rahmani F., Haghighi M., Estifaee P., Synthesis and Characterization of Pt/Al2O3–CeO2 Nanocatalyst Used for Toluene Abatement from Waste Gas Streams at Low Temperature: Conventional vs. Plasma–Ultrasound Hybrid Synthesis Methods, Microporous and Mesoporous Materials, 185: 213-223 (2014). Kiani S., Mansouri Zadeh M., Khodabakhshi S., Rashidi A., Moghadasi J., Newly Prepared Nano Gamma Alumina and Its Application in Enhanced oil Recovery: an Approach to Low-Salinity Waterflooding, Energy & Fuels, 30(5): 3791-3797 (2016). Contreras C., Sugita S., Ramos E., Preparation of Sodium Aluminate from Basic Aluminum Sulfate, Advances in Technology of Materials and Materials Processing Journal, 8(2): 122 (2006). Yu J., Bai H., Wang J., Li Z., Jiao C, Liu Q., Zhanga M., Liu L., Synthesis of Alumina Nanosheets via Supercritical Fluid Technology with High Uranyl Adsorptive Capacity, New Journal of Chemistry, 37(2): 366-372 (2013). Han S., Chen J., Zheng P., Qing P., Characterization of Nanosized Al2O3 Powder Synthesized by Thermal-Assisted MOCVD and Pasma-Assisted MOCVD, Iranian Journal of Chemistry and Chemical Engineering (IJCCE), 30(3): 83-88 (2011). Karami B., Eskandari K., Khodabakhshi S., An Efficient Synthesis of New Khellactone-Type Compounds Using Potassium Hydroxide as Catalyst Via One-Pot, Three-Component Reaction, Journal of the Iranian Chemical Society,11(3): 631-637 (2014). Karami B., Tae M., Khodabakhshi S., Jamshidi S., Synthesis of 1, 3-Dithiane and 1, 3-Dithiolane Derivatives by Tungstate Sulfuric Acid: Recyclable and Green Catalyst, Journal of Sulfur Chemistry, 33(1): 65-74 (2012). Khodabakhshi S., Karami B., Eskandari K., Hoseini S.J., Rashidi A., Graphene Oxide Nanosheets Promoted Regioselective and Green Synthesis of New Dicoumarols, RSC Advances, 4(34): 17891-17895 (2014). Li X.-T., Zhao A-D., Moa L-P., Zhang H., Meglumine Catalyzed Expeditious Four-Component Domino Protocol for Synthesis of Pyrazolopyranopyrimidines in Aqueous Medium, RSC Advances, 4(93): 51580-51588 (2014). Chng L.L., Erathodiyil N., Ying J.Y., Nanostructured Catalysts for Organic Transformations, Accounts of Chemical Research, 46(8): 1825-1837 (2013).